We are constantly learning and striving to advance the standard of patient care in our office. As such, we have recently added a new procedure to your routine professional teeth cleaning to help fight gum inflammation (gingivitis) that can lead to periodontal disease (periodontitis). Our hygienists have been certified to use lasers as part of the high standard of care we offer. Periodontal disease affects approximately 80% of adults and continues to be a growing epidemic in our society. Periodontal disease is a gum and bone infection caused by plaque biofilm and inflammation. Bacteria that remains undisturbed, produces this biofilm that begins the inflammatory process. Over the last few years improved techniques have been developed to better eliminate this irritant. During your routine hygiene appointment, the use of soft tissue diode lasers can do much more to enhance your gum health than traditional scaling and root planing can do alone. 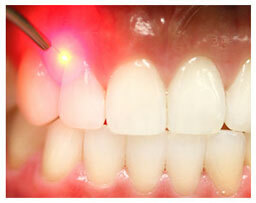 Before cleaning of the hard tooth surfaces, the laser is used to eliminate the bacteria under the collar of the gum. · Reduces bacteria from getting into your blood stream. Most patients will have some bleeding during the cleaning process. This allows the bacteria that are present in your mouth to flood into your body. Latest research shows that oral bacteria may be linked to a number of other diseases such as cardiovascular disease, diabetes, low birth weight babies and more. · Prevents cross contamination. Infected pockets in one area of your mouth can spread to other areas. Decontamination minimizes this chance. · Kills the bad bacteria that may cause periodontal disease. Regularly eliminating the bacteria in the pockets allows the good bacteria to re-populate the area, thus improving your overall health. Ultimately, by eliminating bacteria under the gums, inflammation and bleeding is reduced and periodontal disease is better managed. This decontamination process is painless and normally takes about 5-10 minutes. Please ask one of our hygienists or any of our educated team members, if you have any questions regarding treatment.